Solipsistic Pop are proud to be sponsoring Poet In The City this month with an event in Kings Place, London – exploring the relationship between poetry and illustration. Philippa Johnson, a regular contributor to Solipsistic Pop, will be creating work in response to the poetry of Colette Bryce live on the night. A special event featuring distinguished poets and illustrators Simon Armitage, Chris Riddell, Philippa Johnson, Heather Phillipson, Colette Bryce and Nick Hayes. This event will explore the relationship between poetry and illustration and how the two disciplines engage to create fascinating visual and verbal dimensions and reveal ideas in exciting and unexpected ways. This is a rare opportunity to hear how some of our best loved poets think about illustration and what exactly some of our illustrators think of poetry – all while our poets and illustrators create work live in front of us! a CBE in 2010 for services to poetry. Colette Bryce, critically-acclaimed, she has published three collections with Picador, The Heel of Bernadette (2000), The Full Indian Rope Trick (2004) and Self-Portrait in the Dark (2008). She received the Cholmondeley Award in 2010. Heather Phillipson is a poet and artist. Her poems have appeared widely and she has performed across the UK and in Europe. She is a Faber New Poet and received an Eric Gregory Award in 2008. 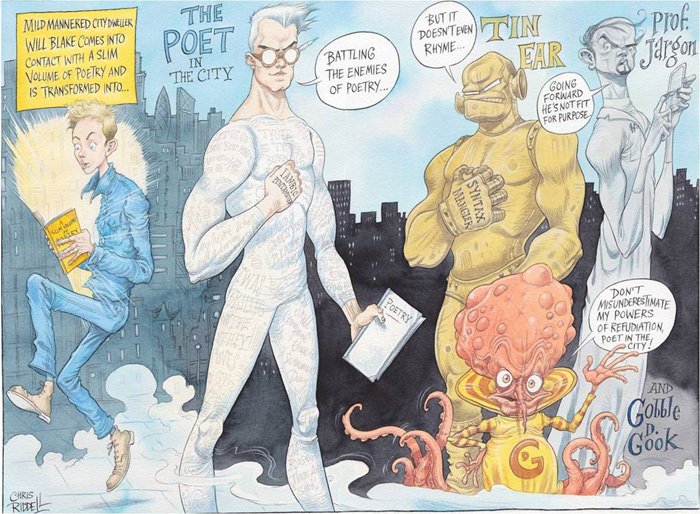 Chris Riddell is one of today’s most popular illustrators. He has illustrated over 100 books, won multiple awards and is The Observer’s political cartoonist. Nick Hayes is an author and illustrator and has won two Guardian Media awards. His first book, The Rime of the Modern Mariner, is a graphic novel and a new poem inspired by Coleridge’s tale. Nick is a political cartoonist for the Guardian and was founding editor of Meat Magazine. Philippa Johnson, trained in Textile Design and graduated from Chelsea School of Art in 2004. She has since concentrated on texture rather than textile, working in a variety of media as a surface artist/designer and stylist for sets and photography. For enquiries relating to your booking please contact tickets@kingsplace.co.uk. To check ticket availability please use the online booking service.